The role of Fathers is so important and influential in all of our lives. So influential that the presence or lack thereof is sure to make a major impact on one’s life. It’s no secret that Mother’s day is widely celebrated more energetically than Father’s day. But it’s important that no Father goes underappreciated. Dads are awesome. They share valuable life lessons and inspire us in many ways. 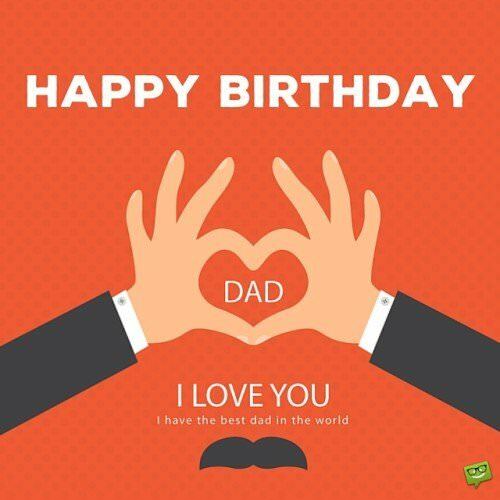 One of the best opportunities to express your love and appreciation for your dad is on his birthday. They may not admit it, but every father wants to feel appreciated on his birthday. No matter the gesture, big or small, expensive or not. Your father is sure to be gracious for the way you choose to celebrate his special day. 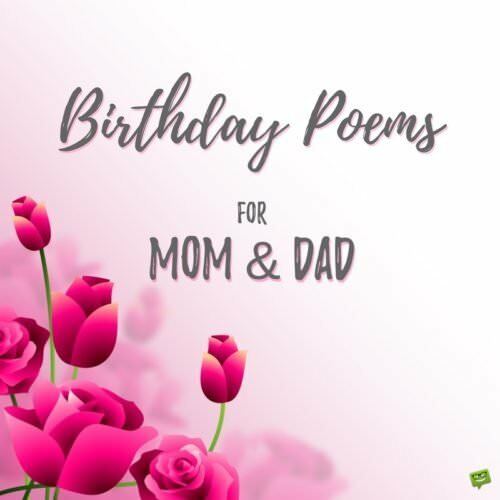 Wish your father a very happy, blessed birthday with any of these wonderful birthday wishes for dad. Happy Birthday, Daddy! No matter how old the world sees you, Mom and I will always believe you are the handsomest dad that ever lived. If it was meant to be the storks’ job to give the best babies to the best parents, you should have been given a diamond child. Unfortunately this was not the case and you were stuck with me. So, Happy Birthday, Dad! From the luckiest mislaid parcel that was ever delivered. Of all the things you’ve taught me over the years, dad, two have stood out in my mind. 1. Always be on time and 2.Always pay your way. I hope today I can make you proud that your teachings have made their mark on me. 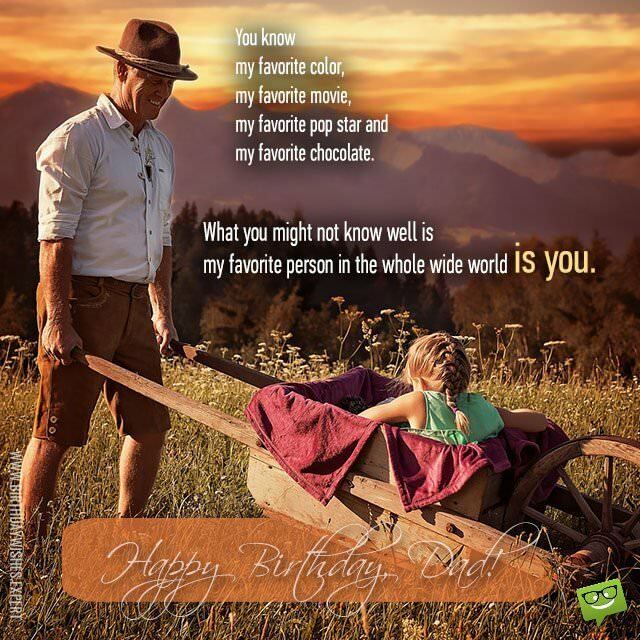 Love you Dad – Happy Birthday! If there’s one good thing about having children so young like you did, it’s that there’s so much less of a gap when it comes to our culture and understanding. For that reason we got you a digital present! All you have to do is go to the play store, install Dropbox, download the voucher, find the pickup on Google maps and self checkout with your touchless card. Happy Birthday, Dad! And Good luck! It’s a good job one of us remembered. Happy Birthday, Dad! Dear Dad, it still amazes me that you are 10 times a nicer granddad to my children than you were a dad to me. No fair! Happy Birthday. Dad, I know how selfless and giving you are so I didn’t get your favorite flavor birthday cake today. Instead, I got my favorite flavor… and I also paid for it with your money. Happy Birthday! Today is your birthday, Dad. But Mom still gets the reward for putting up with you for all these years. She is a trooper! Dear Dad, thanks for all the times you embarrassed me in front of my friends and scared my potential boyfriends away. Enjoy your birthday! You’re welcome for remembering your birthday, Dad. Love you and have a good one! Happy Birthday, Dad. If it makes you feel better, you’re not old, you’re just well-seasoned and experienced. Congratulations, Dad! You’re old enough for a senior citizen’s discount. Tonight, you’re birthday dinner is on me. You’ll always be a “cool” dad in my eyes. Stay young and hip. Happy Birthday to you, Dad. Happy Birthday, from your loving children. As you gift, we giving you a class on Facebook etiquette. Age is just a number. In your case, it’s a really big number. Happy Birthday, old guy! Dear Dad, there were many times when I had doubts and objections about your parenting methods. But you must have been an awesome dad because I turned out pretty decent. Happy Bday. Love you dad! I’m so grateful for the day of birth. Mostly because I wouldn’t be here if it weren’t for that day. Happy Birthday, Father. Dear Dad, you’re old but your life isn’t over yet. Keep adding to your bucket list because you have so much life to live. How it feel to be a year older and watch your six pack of abs turn into a six pack of bear? For your birthday, do something that will make you say, “What was I thinking?”. Happy Birthday to the #1 Dad. Happy birthday to our amazing Dad! May today bring you peace, happiness, and a lawn that mows itself! Happy birthday, Dad! Mom says that she planned to have one son (me), but ended up unwillingly with two. Thanks for being the extra kid in our family and don’t forget to pick up your room! Happy birthday to my wanna-be comedian Dad! Here’s hoping you finally find someone who will laugh at your jokes this year. Here’s to you, Dad! Birthdays can have various meanings to different people, but to you they mean your cake is one year closer to setting off the fire alarm. Happy birthday, old man! Dad, let’s slow down on adding on years to your life. I’m not quite prepared to start changing your diapers just yet. Here’s to my always-young father on his birthday! Happy birthday to the funniest pajama-wearing old man in the neighborhood. So glad you finally decided to start wearing a robe when you go out to get the mail! For your birthday, I give you a genie to grant you three wishes. Don’t waste your wishes on more cake like you did last year! Happy birthday! Dad, just like you, I want your birthday party to be awesome. Too bad there won’t be room for guests since your candles will take up all of the space! All in good fun, happy birthday! I wanted to get you a funny card, but I couldn’t find one that was just right. Instead, I decided to write one myself. “Roses are red. Violets are blue. Laugh even though this isn’t funny, can you?” Happy birthday! You have a heart of pure gold. You possess astounding strength and wisdom. I have learned so much from you, Dad. Happy Birthday. Have you as a dad is the greatest gift of all. How could I ever repay you? Happy Birthday. Life just wouldn’t be the same if it weren’t for your presence, guidance, and dedication to fatherhood. Just when I think you have run out of life lessons, you surprise me. Thanks for everything! Happy Birthday. Wishing you a very happy birthday, from the bottom of my heart. Love ya, dad! You’ll never know how much the little things you do impact me in the biggest ways. I love you, Dad. Hope you have a great birthday! This is the most special day of the year. Wishing you a wonderful birthday and a hopeful future. Everyone thinks their father is the greatest in the world. The difference when it comes to me is…my father actually is the greatest father in the world! Happy Birthday, #1 Dad! With each passing year, I get more and more grateful for your presence. Enjoy your birthday, dad. You were there when I first learned to walk, ride a bike, drive a car and on my first plane flight, it’s all thanks to you that I’ve seen the world, dad, I just wish I could have brought you with me. Maybe on my next adventure i will! Happy Birthday! From the proudest daughter in the world to her adored father, if you have half as much fun on this special day as i have had on the many birthday’s you have given me, it will certainly be one to remember! Happy Birthday, Dad! You know my favorite color, my favorite movie, my favorite pop star and my favorite chocolate. What you might not know well is my favorite person in the whole wide world is you. Happy Birthday, Dad! If there was an award for the best dad in world, there probably would be something like a billion candidates, but you would get my vote. Happy Birthday, Dad. 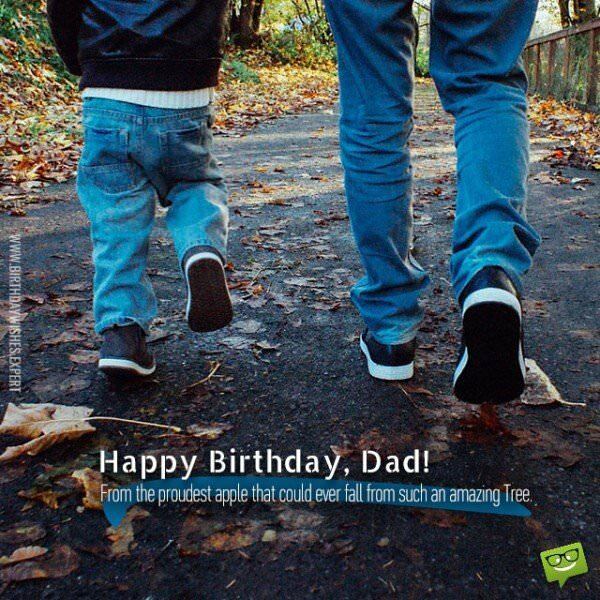 To my father who has managed somehow to get through raising a naughty and tedious son! Where most would have failed you have prevailed, and for that you will have my love and respect for all of time. Happy Birthday, Dad. You’ve been a teletubby, a dinosaur, a lion and a pirate . You’ve played Elmo, the Easter bunny, a ghost and of course Santa. But today you are playing the best dad of all time, and for that you don’t need a costume. Happy Birthday, Dad. I haven’t told you enough how much I appreciate everything you’ve always done for me, I only hope today i can make a start. Happy Birthday, Dad, from a loving son. My daddy is the best father in the world. Happy Birthday! Happy Birthday to my dearest father who has always supported me in everything I’ve ever wanted to do. From a loving son who owes all of his success and more to his old man. The shelves might be full of my medals and trophies, but every one of them has your name on it in my eyes. Happy Birthday, Dad. Dear Daddy, i was going to make you a card that showed all the things I love most about you, but I ran out of space, so I gave up. Happy Birthday! To my dearest dad on this most special day, i can’t be with you but i want to let you know that I’m thinking of you, wishing you have the best of days, and that everyone gets you exactly what you wanted and deserve! Happy Birthday, Dad. You’re the best! And your daughter is coming to see you as soon as she can! All my love. Growing up, I knew I had a fun dad, but it wasn’t until I became a dad myself that I realized how awesome you are. My kids have the best grandpa around and I am so happy you are so active in our lives. Happy birthday, Dad! Happy Birthday to my cool dad. I may not have been the nicest teenager to you, but I want you to know I now realize how valuable you are to me and how blessed I am to have you in my life. Please accept my apology and wish to move forward positively, especially today. Happy birthday! Not everyone has been as blessed as I have been with such a kind, supportive, and loving father. You have molded me and shaped my life in such a way that I see nothing but positivity in my future. You are the best. Happy birthday to my personal mentor, my dad! Father, I am so happy and honored to be celebrating another birthday with you. Each and every year is better than the last. Thank you for all of your unending love. Happy birthday, Pop! They say a parent’s love is unconditional. I am so thankful this is true, as I have caused some trying times for you in my youth. Having you stand by me has meant the world to me and I promise to always be by your side as well. Happy birthday, Dad! There is no gift that I can buy that could measure up to the love that I want to express. There are no words that could sum up what I really want to say. Have an amazing birthday, Dad. You mean so much to me. On this most blessed of days, we praise God for the gift of you, dear Dad. In our youth, you taught us the importance of honesty, trustworthiness, and kindness. And in adulthood, you taught us the importance of seeing and passing on these traits to others. It is because of you this world is a better place. Happy birthday, big guy! 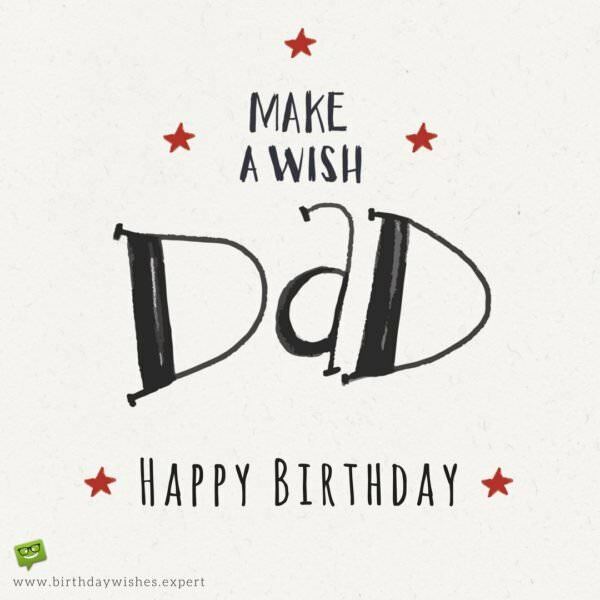 Dear Dad, today I wish you the best of birthdays. You are a great father, solid neighborhood leader, and deeply faithful man. Everyone who knows you feels blessed to have you in their lives and as my role model, you have inspired me to grow up wanting to be nothing else than the great man you became. Happy birthday! I may not always take the opportunities to tell you this. I love you with all of my heart. You have led me in such a positive direction in life and there is no one I would rather have as my role model than you. I am truly blessed to call you Dad. Happy birthday! Father, I greatly respect you. Not only because I’m your son, but also because you are a man of honesty, integrity, and great charity. You are everything that I aspire to be. If I am half the man you are, I would be grateful. I am wishing you a very happy birthday. Dear Dad, thank you for all that you do and all that you have done. No matter the mistakes I’ve made, you always been there to catch me when I fall and build me back up again. Love you forever and always, happy birthday. Thanks for being a great example of a family man. Now I can follow in your foot steps as I start my own family. You words of wisdom did not fall on deaf ears. My footsteps will forever be guided by your words. Happy Birthday to you. I will never stop praying for your well-being. I will never stop hoping for your happiness. You deserve all the love and happiness in the world. Have a wonderful birthday, Dad. 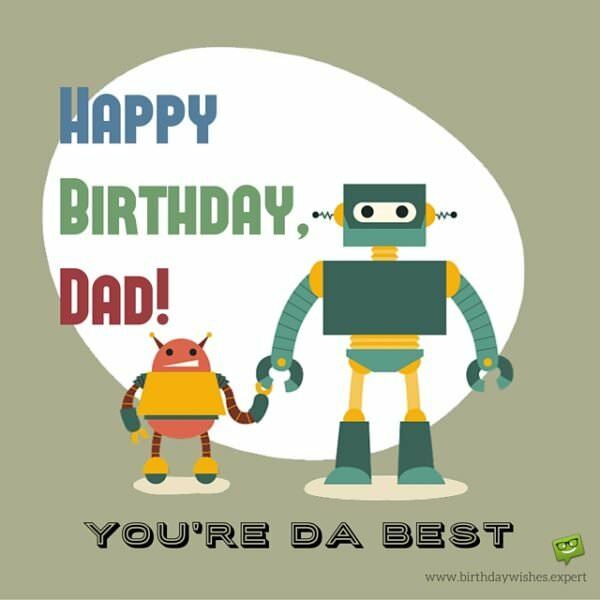 Have a fantastic birthday, Dad. Happy birthday to you from the luckiest daughter in the world. You’re never too old to have fun on your birthday. Enjoy! It’s your birthday! Dance like nobody’s watching. 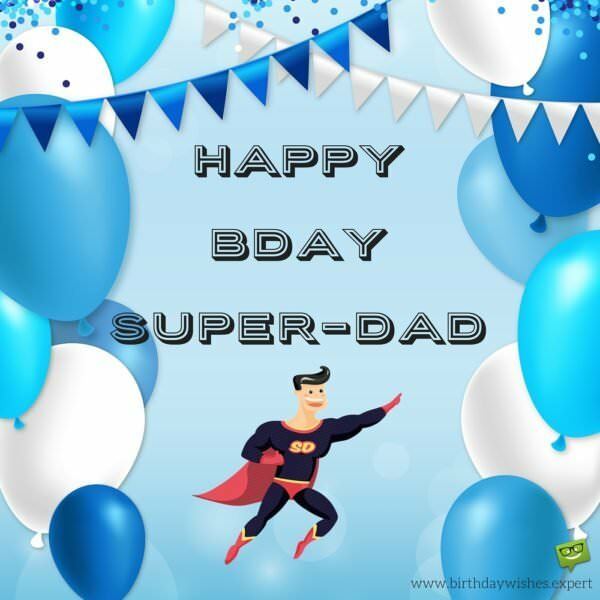 You are my superdad. Happy Birthday! Chase your dreams! Have a blessed birthday. Sending you lots of love on your birthday, Dad. Relax and enjoy your birthday! It’s your birthday, Dad. Do what you want to do. The formula to a happy childhood: a cute dog, nice neighborhood, fun friends and my dad’s bedtime stories. Happy Birthday, Dad. To a farther worthy of a knighthood, from his princess soon to be a queen, Happy Birthday, Daddy! Every yeah I get you something you hardly ever use, well this year all I’m giving you is this message. Try returning that! Happy Birthday Dad! The Stork dropped you lemons and you made lemonade! Thank you so much and Happy Birthday, Dad! If all fathers were like you, the world would be rid of daddy issues, fortunately for all psychiatrists you are a rare breed. Happy Birthday, Dad. To the man responsible for so many of the most precious moments of my life. Happy Birthday, Dad. It’s never too late to make amends, today is the perfect time to start. Happy Birthday, Dad. Happy Birthday, Dad! From the proudest apple that could ever fall from such an amazing Tree. Happy birthday to a man who still remembers what it’s like to light his candles by rubbing two sticks together! On this your birthday, be sure and sneeze often because you can use all of the “bless you” wishes you can get! Dad, happy birthday you Ol’ Geezer! Happiest of birthdays to the only step-father I have ever wanted or needed. May the sun shine down brightly on you and lead your path on this your birthday. 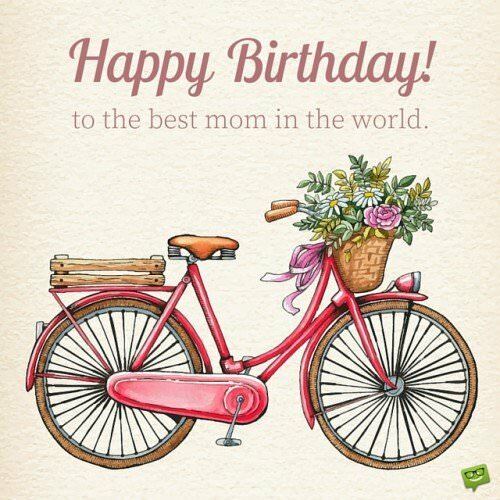 Wishing you a day full of presents and fulfilled wishes on your birthday. Another year older, another year more admired! Happy birthday to my father, the most reliable, honest, and loving man I have ever known! Forgive me for not telling you this more often, but know that I love you on this your birthday and always. Wishing you a new year of chances and opportunities for love and fun! 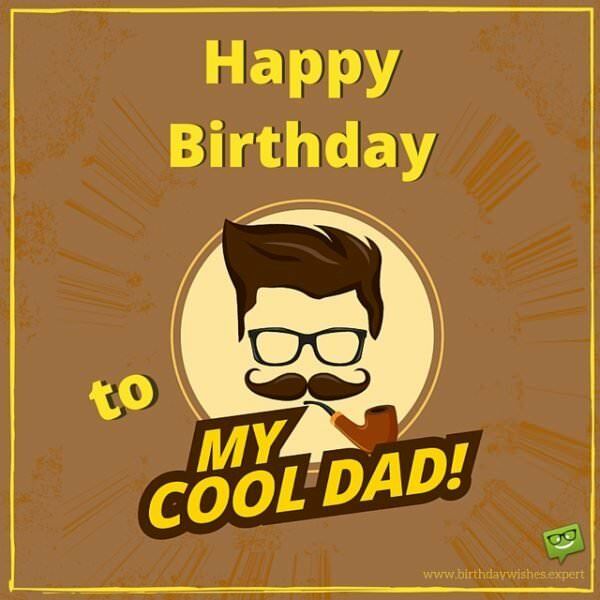 Happy birthday to my dad, the coolest guy in town! Once upon a time, God blessed me with an amazing man to call “Dad,” to whom I wish the happiest of birthdays today. Happy Birthday dad! You’re da best. Thanks for all you do, Dad, and happy birthday! Three cheers to the man who gave me life and purpose! Happiest of birthdays today and always, dear Dad! 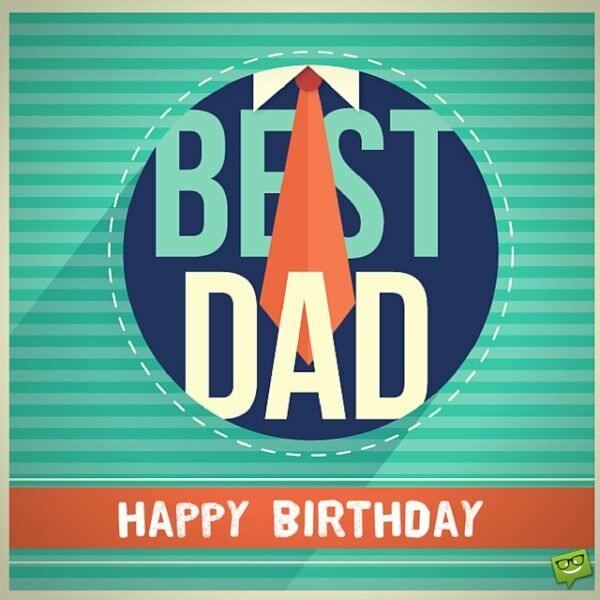 We wish you one amazing, rocking day, Dad! Happy birthday to the funniest, craziest dad for which a girl could ask! 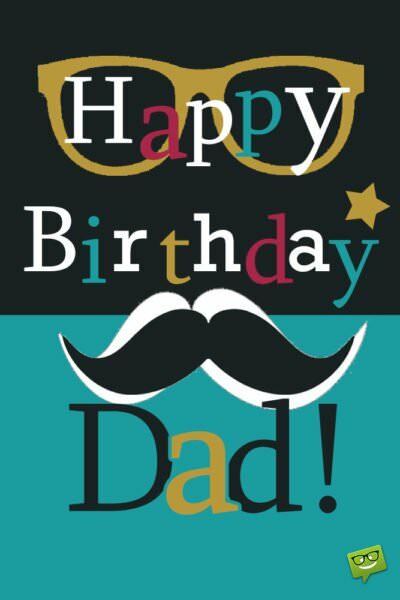 Happy birthday, dear Dad, for whom I give thanks to God each day! Happy Birthday. Love you dad! Dad, you are my biggest role model in this world. Today being your birthday, I pray that you are blessed with all the desires of your heart. May you always carry a smile on your face and be healthy and strong. Have an amazing birthday, dad. 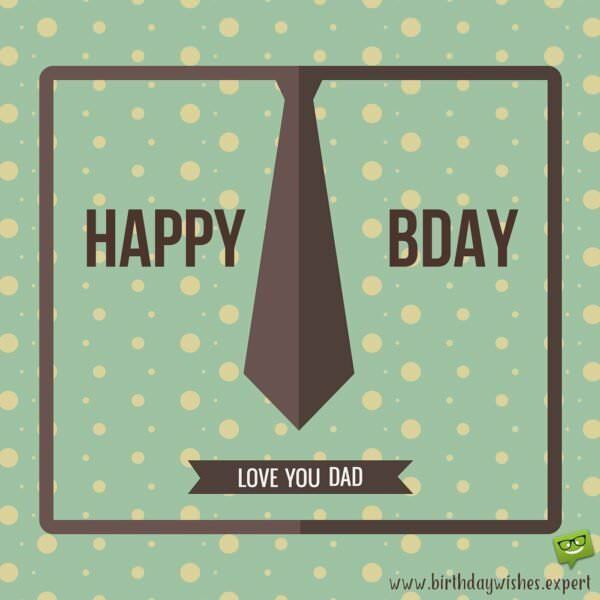 Dad, may this occasion of your birthday celebration bring prosperity, peace and happiness in your life. Have an amazing birthday. Sending birthday blessings to you, dad. May God’s blessings keep your heart and soul happy all the days of your life. Have a memorable birthday. Love you. I couldn’t have asked God for a better step father. Thank you for being such an awesome stepfather and friend to me. I love you so much and wish you a fabulous birthday. Hope you have a blast. Happy birthday to the greatest stepfather in the whole wide world. Dad, may you always wake up in the morning with happiness in your heart and a smile on your face. Have a lovely day. I was devastated when my Mom and Dad got divorced, but then you came into my life and made things better. Thank you for being such a loving and understanding stepdad. Happy birthday. Happy birthday, my sweet stepdad. I must confess that sometimes I find it difficult telling the difference between my real dad and you thanks to the incredible amount of love you show me. Thank you for all you’ve done for me. May God richly bless you. I love you. Enjoy your day to the max. How blessed I am to have a stepfather who I love and who loves me in return! Happy birthday, my dear stepdad. In addition to my Mom, may happiness always be your companion for life because you’re good people. Happy birthday. I’m so glad that the relationship between us has remained cordial so far. I pray that it continues that way, so we can always be a united and happy family. Thank you for being a good stepdad. Happy birthday. 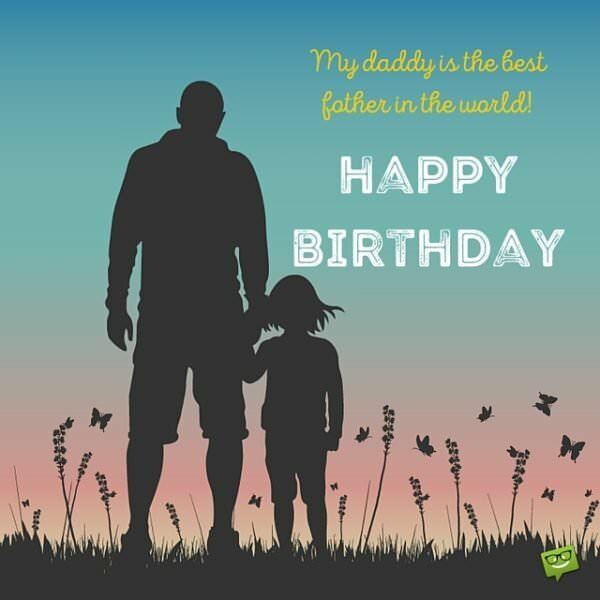 Watch and Share this Birthday Wishes video with your dad.